Fashion designer Lela Rose has a side hustle. Two, actually: party planning and writing about it. 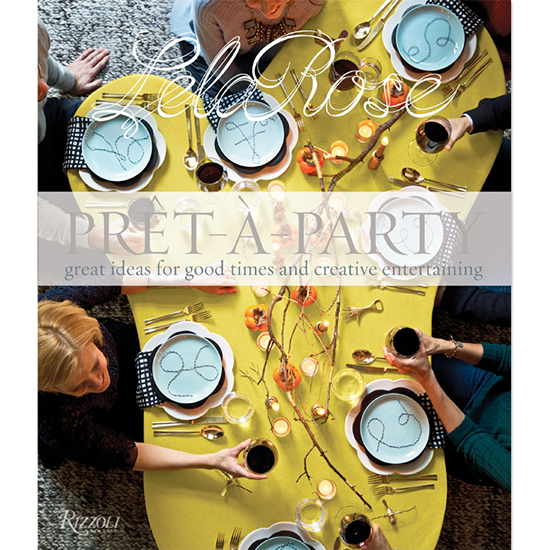 To celebrate the launch of her new book, Prêt-a-Party ($40; rizzolibookstore.com), the entertaining ace dishes up tips on crafting a Pinterest-worthy place setting. Here, Rose reveals four of her favorite DIY tabletop tricks to follow when hosting VIPs. "Arrange baker's twine in the shape of the first letter of each guest's name on a solid-colored plate," Rose tells InStyle. "This works just as well for little girls' birthday parties as it does for adult dinner parties." "For outdoor dining, I use pinking shears to cut bellybands out of craft paper. I write the menu on the bands, then wrap them around the plates. When you bundle these together, you can simply pass around premade place settings rather than setting up plates, napkins, and cutlery individually." "Try bringing an element from your centerpiece onto each place setting for a cohesive tabletop look. Here, the party theme was a pig roast and my centerpieces were fresh vegetables, so I placed one veggie, like a carrot, atop each guest's napkin." "I recycle the backs of my leftover holiday cards to make DIY name plates for guests. The gold foil is the kind used for auto-body detailing—it's adhesive on one side, so you just cut out the letters and stick them onto craft paper or cardboard."